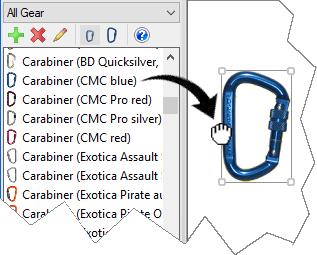 vRigger is Windows-based software that lets you create rigging systems on your PC (or Mac with additional software). Whatever your rigging needs, let vRigger help you illustrate your systems. vRigger features a modern interface that is very similar to Microsoft Office®. If you're familiar with Office, you'll feel at home with vRigger. The ribbon-style toolbar at the top of the screen organizes common tasks into easy-to-locate panels. To add gear to your rigging system, you simply drag it from a gear pane and drop it on the screen. Watch a video about adding gear to your system. When you drop gear on other gear, the items automatically connect. Sound effects add an auditory experience to your virtual workspace. Watch a video about dragging, moving, and connecting gear. 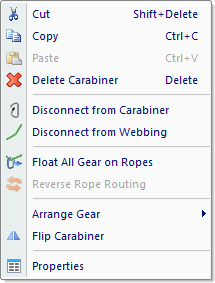 You can use your mouse to grab any point on a rope and then drop it on gear to "attach" them. When you rearrange gear, the rope automatically stays connected to the gear. Watch a video about working with ropes and knots. Don't worry about making mistakes—the Undo and Redo commands are only a click away. When you click your right mouse button on gear, a menu containing commands relevant to that item is displayed. After clicking on the gear, pick a command. It's that easy.